The conversion of an abandoned riverfront mill site into a modern 21st Century educational campus for two new middle schools was hailed by the City of Woonsocket as "One of the most important and successful projects in the City's 125 year history". The site contained three four-story masonry mill buildings, one historically significant two-story masonry administration building, one masonry and steel production building, and one historically significant guard headquarters building. 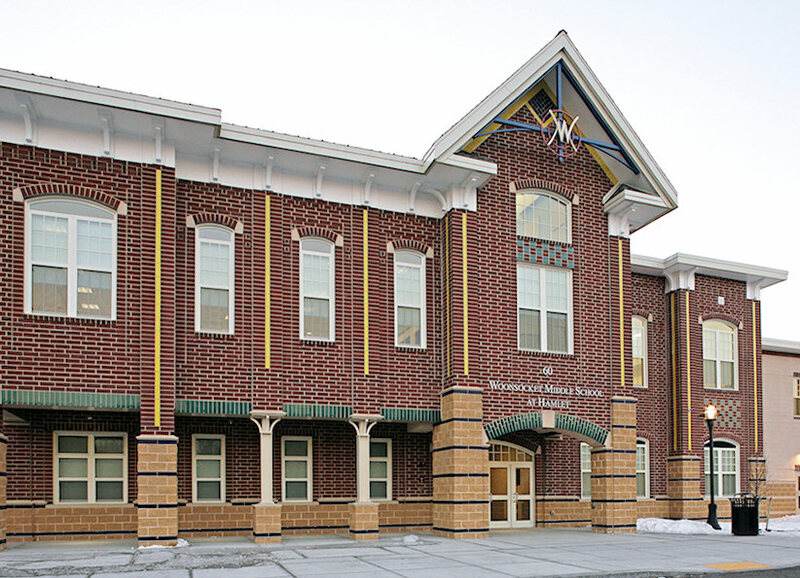 The project included re-use of two of the historically significant buildings on the site, and incorporation of these buildings into the educational program. The architectural design includes subtle references to the former mill buildings and factories that once occupied the site. Due to the extreme complexities associated with this site, development required collaboration between the Design/Construction/Owner team and numerous State and City departments including the Department of Environmental Management (DEM) and the Army Corp of Engineers. The complete middle school campus accommodates 1,760 pupils and over 200 faculty, staff, and administration members.